Unifyed has developed web and mobile apps that interoperate with every leading Learning Management System (LMS) to deliver the right information and services to the right people – anytime, anywhere. These apps send automated push notifications whenever new events take place inside the LMS, such as grades posted, announcements, messages and more. Seamless integration with your existing LMS to deliver real time information. 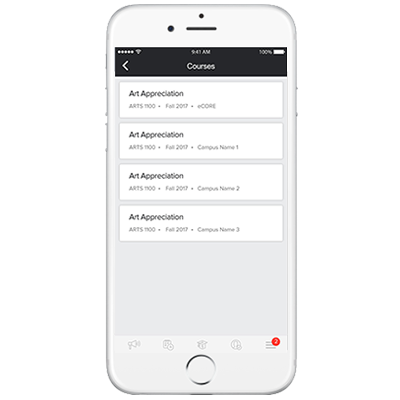 Apps push real-time updates to the users’ device notifying them with the latest information available, such as grades, quizzes, courses, etc. Enables the students to access quizzes and assignments posted in the LMS through the Unifyed platform. Allows students to communicate with each other and with student communities on campus through the Messages app. Students can start new forums or participate in existing ones based on subjects of their interest. Responsive to web, mobile-web and app interfaces for improved accessibility and seamless student experience.